Bruce was one of the founders of social-political speculative and cyber-fiction magazine The Future Fire (where my story “Thick on the Wet Cement” was published) and a co-editor of fiction for over five years. He returns now to look back over the last decade, and answer a few questions about editing, about fire, and about the future. How did you first get involved with The Future Fire? What is the first story you can remember buying for the zine, and what did you love about it? Bruce Stenning: Djibril, being my most ancient of friends… Ah, let me start that again. Djibril, being my friend of longest standing, asked me to get involved 😉 Sadly, due to being blighted by hereditary poor memory, remembering ten days ago is a strenuous effort, let alone ten years ago. The story that really stuck with me, although not from a particularly early edition, was Melanie Rees’ “Ephemeral Love.” It is: the story of a world that gets some much needed recuperation time from its inhabitants; a story about the potential for rebirth; and a reminder to be mindful of the beautiful world that can and has nurtured us for better or for worse. Which institution would you most happily set on fire? BS: I avoid lighting the gasoline, but in my thoughts it would have to be any and all states or organisations that seek to enrich themselves through the destruction and misery of others. Top of the list would be nation states that engage in military action abroad under misappropriated pretences in order to gain power, influence, wealth… These actions rarely achieve any of the stated goals, often fail to achieve the unstated ones, and almost always cause the mutilation and murder of innocent civilians. And then there are the producers of the weapons used: These organisations will happily build and sell arms to their home nations for use abroad, and are then encouraged to market their produce to approved customers abroad in an effort to further profit their home nation’s economy. Oh, sorry, did you mean “institution” figuratively…? Now where did I put that figurative jerry can? BS: Injustice: I hate it for having to exist. And I love it because in recognising it gives us the ability to defeat it. What does the next ten years hold for the world? BS: My personal hope for the next ten years will be to see the population become more aware as whole of the way in which our societies work or don’t work, and move to fix them. Although at times the situation seems quite bleak, I think I see light here and there. There seem to be burgeoning movements using information technology to encourage people to speak truth to power as a body. Unfortunately the powers that be still seem to have trouble accepting what democracy means. On top of that there is the ever present drive to keep people preoccupied and therefore obedient. But I think greater access to technology and a recognition of solidarity is having a positive effect. On that note, I recently watched They Live again after hearing of the sad passing of Roddy Piper. I’d encourage everyone who hadn’t seen that film to search out for it! The next ten years will contain a lot of struggle, but also a great deal of growth in renewable energy and a great deal of growth in more sustainable endeavours. And, all being well, another ten years of The Future Fire! BS: Well, we are celebrating the tenth anniversary of The Future Fire by publishing an anthology of reprints and newly commissioned material. A crowdfunding campaign is being run throughout August to pay the authors and artists a fair rate for their work. 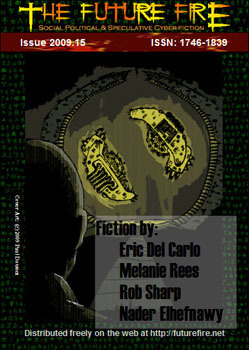 You can pre-order the anthology, and also pick up e-book or paperback copies of previous and forthcoming TFF books. In addition to the main fundraiser target there are also stretch goals that include increased pay for the contributors to Fae Visions of the Mediterranean horror anthology and increased pay for TFF magazine contributors for a 12 month period. Bonus items for fundraiser backers include story critiques, custom art, and personalised knitted zombie dolls! Please support the campaign at igg.me/at/tffx/ .